where children and adults are partners in life-long learning. respect and compassion underpin our policies and practice. participation and the use of new and developing technologies. Congratulations everyone at Garretts Green Nursery School for being graded an Outstanding school. Ofsted report available to read and download soon. On behalf of the staff and governors may I extend a very warm welcome to you all. We acknowledge the importance of working alongside parents in a partnership which ensures that children make good progress and enjoy their year at our school. Our staff team understand the care needs of young children as well as being skilled educators. 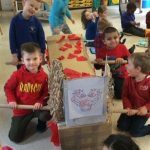 The school employs qualified teachers and teaching assistants who work closely together to provide an exciting curriculum which inspires and motivates children to learn. Garretts Green Nursery School has a long history within the local community, opened in 1947 to provide places for the young children of mothers who were required to work after the end of World War 2. 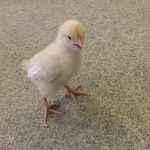 Since then, countless numbers of children have passed through our doors, many returning with their own children or grandchildren, enjoying the positive changes which have made the school happy and successful. I hope that this website provides you with the information you need but you are welcome to contact the school office and speak to Trish Daniels should you have any additional questions. and independence, a love of learning and a willingness to 'have a go'. 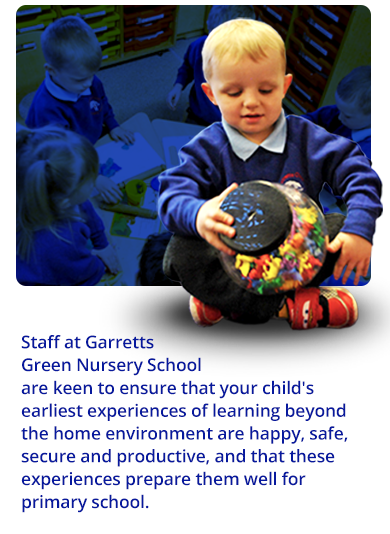 At Garretts Green Nursery we ensure you are fully informed of all the policies we have in place. Click on the following link to view our session times each day for the mornings and afternoons. Our Blog page is updated regularly by our staff to keep you informed of all the activities taking place. Come and see all the fun and activities our children and parents enjoy.